The Kraken is here! And upon reflection, it would have been a good idea to run far away from it! This is definitely in the group of super hots that normal people shy away from. 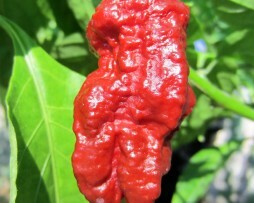 It’s a cross between Bhut Jolokia Assam and Trinidad Chocolate Scorpion and the pods grow extremely large. 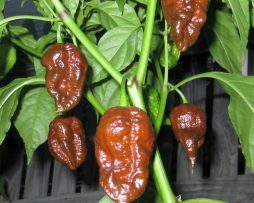 Like quite a few of the brown super hots, the taste is sort of earthy and smoky. The heat from this one is brutal and it’s a winner for a hot chilli sauce! The Wartryx, OMG THE WARTRYX! We feel as though the MA Wartryx should have its own drum roll. This chilli already has legendary status on several planets! Grown by Matthew Arthur, it is apparently a cross of 5 different chillies and a bit of a freak of nature! A crunchy, fruity and super hot pod as well as a tiny bit floral with an all over mouth burn. You will not forget this experience in a hurry! This one is still very hard to get so get it while you can! It would come as no surprise the Machu Pichu Chilli comes from Peru, the home of many of our best chillies. This unusual and rare plant is robust and can produce huge crops of large, dark brown fruit. The taste is rich and Smokey and makes an excellent powder! It is also great used fresh. A must have if you like something different! 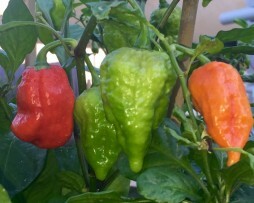 The 7 pot Madballz or Madballs 7 is a cross between a Trinidad Yellow 7 Pot and a Chocolate Bhut Jolokia. It is fruity and floral and has lots of heat. The pods are a great colour and get all wrinkly. 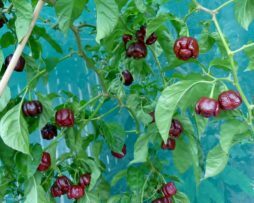 A terrific chilli and well worth growing! 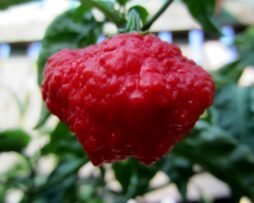 This rare chilli comes from Ghana in Africa and its origins seem to be lost in the mysteries of this timeless land. It certainly has the chinense taste and is a little fruity and has been described as having a distinctive taste of its own. The Mako Akokoscrade has enough heat to keep most people satisfied! Perfect for cooking and making powders. We love growing this one, it has great mystique! A semi-wild, beautiful compact chilli pepper plant from Brazil. The small, red-orange berries have quite a thin flesh and moderate heat. We agree with Nigel Carter’s Pod review that they are very sweet with a pleasant grassy green fresh flavour. They have more of a peppercorn burn which peeks quickly and mellows out to an interesting black peppery after taste. 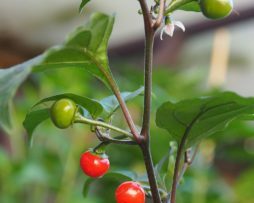 Absolutely great looking chilli plant that producing masses of fruit. Very easy to grow/maintain and would make a stunning bonsai we think. This chilli is probably the biggest of the Naga’s. They are very large, thick and juicy pod. The bush is very productive and easy to grow. Beware of this chilli. It’s called SUPER HOT for a very good reason! The thing we noticed first and really love about the Brown Moruga is the amazingly consistent classic moruga shape! It still has that awesome mind blowing heat that will make you question your sanity, with a slightly fruity aftertaste. The bush is one of the most productive we have ever had. 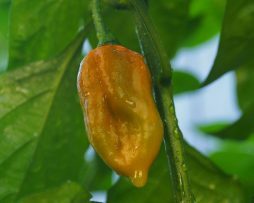 This plant alone will keep you making chilli sauces and powders for a very long time! Clocking in at a respectable 1.2 million SHU’s the Moruga is up there with the hottest. The heat builds slowly so be careful! The bush will grow quite tall in the ground and is a great producer. The fruit is a great shape too! 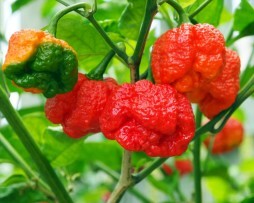 The Moruga should be in all chilli lovers collections. 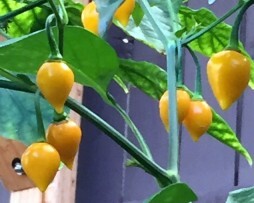 If you love the Trinidad Moruga Red then we think you will love the yellow variety even more. From what we have been told it’s a natural occurring variant of the Moruga Red being slightly sweeter with a definite citrusy tang to it(if you can taste this past the heat that is). Of the all the superhots the flavour of this one is a standout. Pod size is respectable but a tad smaller than the red variety. A special one for the serious chilli head – so what are you waiting for :-). This is such a pretty little delicate chilli plant and looks great in the garden. 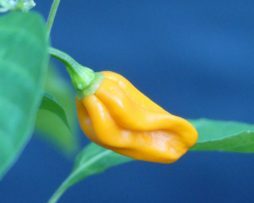 A chilli pepper species from Brazil this one is a stunner with the pods being quite sweet. The Devils Tongue Mustard is another natural occurring colour variant of the original Devils Tongue Yellow variety. The plant produces a prolific amount of pods about 5cms long and 2.5cm wide. Fruit change from a pastel light green to a greenish mustard colour when mature. They’re pretty darn hot and have quite a sweet taste. Why not grow the chocolate, yellow and mustard to get tongues wagging. Check out the Chocolate Devils tongue as well here. Check out the Yellow Devils tongue as well here.